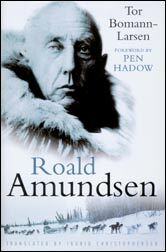 This is the only full biography of Polar explorer Roald Amundsen to be published in English. It uncovers the life of the determined, pugnacious pioneer, using vivid first hand accounts from his diaries and own books to tell the story, as well as material from recently discovered documents. Determined from childhood to become an explorer, Amundsen joined the Belgica Antarctic expedition in 1897 - the first to overwinter in the Antarctic. His own expedition six years later was the first to traverse the Northwest Passage; he was the first to reach the South Pole; was involved in an abortive attempt to fly over the Pole; and was hailed as a hero. However, the publication of his biting autobiography revealed him as a ruthless megalomaniac and turned the public against him for a time. But his mysterious and tragic death in 1928 - when his plane disappeared during a rescue mission for a colleague - restored his heroic status and it is as this benign hero that he is remembered. Tor Bomann-Larsen explores the drama, humour and adventure of Amundsen's life and reveals the true character of this driven, difficult, cantankerous man who was prepared to do anything to reach his goal.